I cannot place the broomstick closet, it says its locked/ limited item, what do I do? 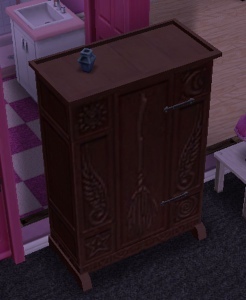 You will have this problem if you try and place it from the new items tab, look in your inventory instead to be able to place the broomstick closet in one of your sims houses. After the time has passed come back and click the exclamation mark above your sims head to find one of the broomstick flying collectibles. 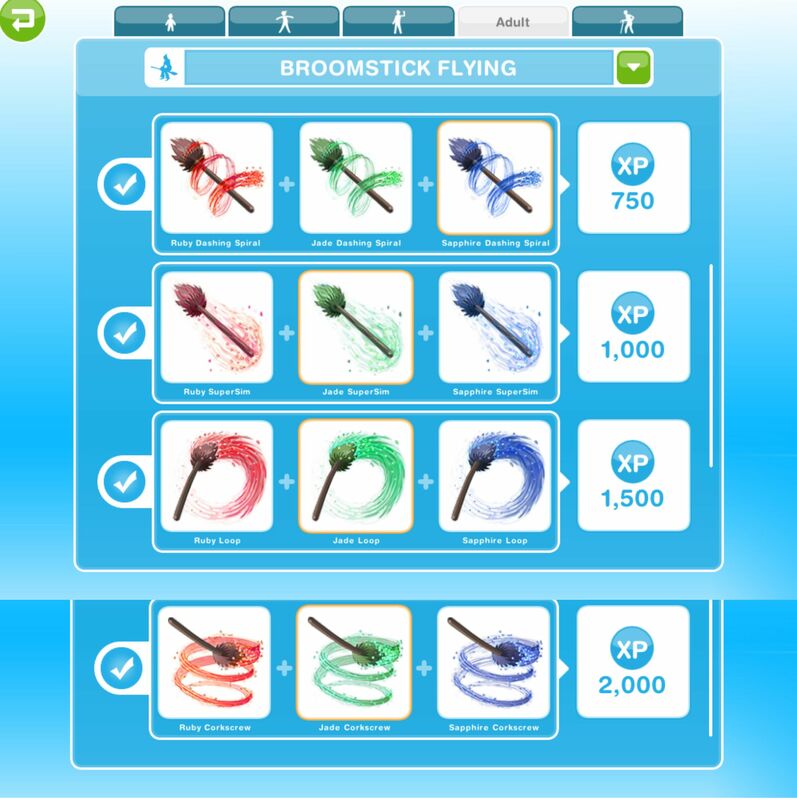 Every time your sims complete one of the options above their broomstick flying hobby skill level up percentage will increase, once they reach 100% they will level up, there are 6 levels. You need to reach level 6 to be able to unlock all of the broomstick flying collectibles, once unlocked you will be able to find them. Broom Master Jade Corkscrew and Sapphire Corkscrew are now unlocked in the hobby collection. If you complete this hobby in the time limit you will unlock the Fantasian Cleaning Mop, I personally gave up trying to complete this hobby in the time limit, after getting the same item 5 times in a row, the mop costs S888,888 from the sorcerous supplies store- it wanders around sweeping, although it does also clean up pee and vomit. Thank you Torie for this picture! Just a tip, but I noticed you can have two sims practicing the spell casting hobby even on the first run as long as one of them is practicing at a neighbour’s house. It’s probably the same for the broomstick flying, although I didn’t unlock it yet. Of course it’s not so easy to find a neighbour with the hobby item. I have the broom closet, if you want to add me as a neighbor. Game Center ID jbs1382. It is located in the two story house behind the swim center. Hi, I have the broom closet and magic wand podium. I need neighbor with broom closet to complete broomstick flying hobby in time. Add me via Facebook, my profil name Bangkit Dwi Lestari. Hi! I also need neighbor with broom closet. I have one at the first house too. Can you add me on fb mum gameon? There are 2 profiles with your name, so not sure which one to send message/add. Thanks! Hello, I’d like to add you on Facebook but apprently it seems like there are more profiles called the same Can you add me instead? My name is Noémi Karbuczky. And it doesn’t even clean! Hi, I was wondering if anyone knows what the mop actually does? I’m deciding if it’s worth spending a hefty amount of LPs to complete the hobby. If it doesn’t serve any purpose then I don’t think I’d want to spend so much LPs completing this in time after the amount I had to spend on the last hobby. For me the mop cleans puke and pee just like the pee cleaner. I spent a lot of LPs to finish the hobby with in 7 dad and was very surprised to see the mop costs §888,888!!! Does anyone with it find this price worthwhile? Are the new dragon pets and magic hobbies life quests for any of the sims? I haven’t seen them come up as options for any of the personality types. I spent so much LP on the owl, only to realise I needed to spend more LP for it. After the ordeal, it prompted me to do the new task and I clicked “not now” cuz I was so tired of spending my LP. I just read your post about the timer still running. I quickly went back and clicked “start new collection” in a hurry. But It doesn’t prompt me to do the Magic mop task anymore…. Do you know how I can start the magic mop task now? Do I have to choose something special? Or will it randomly prompt me again? Have you brought the broomstick closet to be able to do the hobby? I went thru 200 LPs between the 2 wizard hobbies. I ended up rolling the dice in the end and had better luck which never happens. Wait! So _after_ you unlock the mop it still costs 888,888? That’s absurd!! And pointless. Yes it looked cool in the wizard’s house, but it’s just another pointless dust collector really. I was even disappointed with the owl after the spell casting hobby, all you can do is have a conversation? Really? At least the dragons are cute. Wow. I had no idea the stupid mop cost so much! I’ve been working sims in two neighborhoods with zero downtime and like weightlessmagic, I have gotten the same stupid tricks over and over. 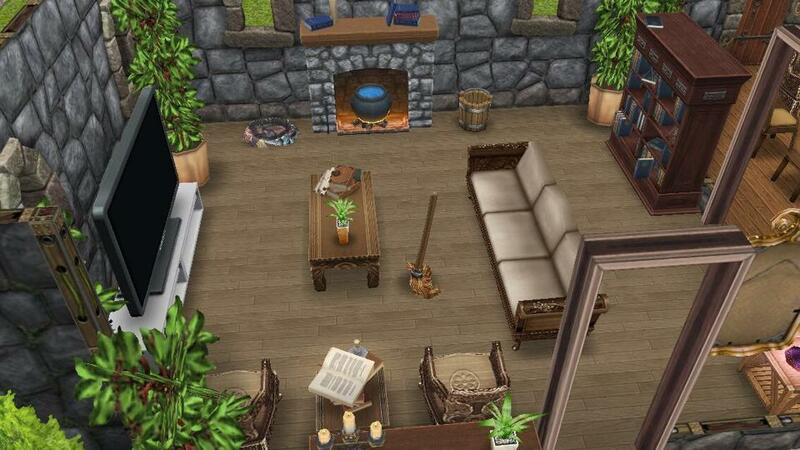 I thought the broom looked looked cute bustling about the wizard’s crib but no way am I going to waste a bunch of LPs on this hobby only to turn around and spend practically a million simoleons on the mop. Some prize! Thank you for keeping us updated with your blog. You are a lifesaver. I know! I have given up on it after getting the jade one several times in a row! Hi there. Just wanted to know where I can access the wizardly home builders kit? I looked everwhere in the home store but can’t find it. Thanks for your time. I also have tried for the stupid mop. I spent only 10 lp today and didn’t even get any new pieces of the puzzle. I have completes 2 long flights between last night and tonight and also did not receive even one puzzle piece and have 3 days left to gain the remaining 6 pieces. I am giving up. At least i can get the wizards building kit without completing the 12 broomstick flights to get the stupid mop and i wouldn’t pay any stupid enormous amount for it anyway! I bought a magic mop. It seems to be useless, it just moves randomly inside and outside the house. I wonder if it can clean a pee pudle. It doesn’t interact with sims (at least the adult ones). Does anyone know what was actually supposedly included in the magic home builders kit? I finally got the last of the twelve broom tricks today (I used no LP, just let the “random” feature run it’s annoyingly long course, this was almost as bad as the fishing hobby), and then perused the home store but couldn’t see anything that hadn’t already been available – magic candelabra, magic bookcase, tomes of knowledge, magic spells stack, cauldron fireplace, magic mirror … these things were all available as soon as I finished building the magic store, so what am I missing? I’ve completed the spell casting hobby but I dont seem to have a broomstick cupboard in the sourcerous supplies shop? How can I get it? If you have completed the spell casting hobby then it should be in the store to buy, if it isn’t then I’m not sure why! I don’t have a broom closet in my sorcers supply store, any suggestions? Have you completed the spell casting hobby? After completeing all of the broomstick tricks or whatever, I finally unlocked the sorcerer’s secret room. Said it can be found in the home store but I can’t find it. Anyone know where it is? You should put more information about this hobby up like how you can get 5 LP after you complete it the first time and where to get the wizard house after completing the hobbt the forst time even if you don’t finish it in time to get the mop. I will when I have actually completed the hobby, I’m not wasting LPs on this one as I keep getting the same items over and over again, be patient. Is anyone aware of if the mop goes after dishes? If it does, then I might actually have use for it. If not, forget it, the times and prices are absurd. I don’t think it does, but I’m not sure! I am so stuck on this book of spells… cannot find the wand to pick up for the second time. And I do not have the stand in my hobbies to find the wand. Can you help? Hi I have a question. I have a teen that is a musician. His hobby has and is costing me a lot! I have tried multiple times to get him to compose the 12 songs to complete the task and I even spent 10 life points on the 3 star piano which is doing nothing more than the 1 star that didn’t cost me anything! He still plays and composes it takes less time 48 minutes vs 1 hr but the same old songs that do nothing to get closer to completing the task. Any suggestions? So how can I get a dragon? You can only unlock dragons if you complete the book of spells quest in the time limit, you can then find them in the pet store. Please add me as a neighbor through facebook. I am in the Seattle, WA (USA) area and I am Daisy Valerie Williams. I tried to put most quest and hobby things in one house (back row far right before bridge) and all haunted and salsa dancing items in house in front of it. I have spell casting and broom flying in another house. If you need something particular, you can email me. I added you but can’t message you to let you know its for sims, not just a weird stranger! My name is Melz so thats me! I have no space left to add anymore neighbours, sorry! I have a broomstick closet if anyone wants to add me, Game Center name is “Wayvern H”. My closet is in the house just below the art gallery. Hi, my sim is stuck in the Wizards house and I can’t go there unless I have another person but it says it’s to crowded for more people. So how do I get in there to get her out? fyi: mop DOES clean up pee (2015). I saw this at a neighbor’s. no idea about vomit or dishes, though. Guys I have no closet on sorcerous supplies?? No it doesn’t clean up plates, that would be nice though! I really wanted this mop if nothing else for looks! Well I ended up spending 150 lps and an extension and didn’t finish. I am mad and broke. If I didn’t love this game I would quit! Omg I cannot move the broomstick closet! Be very careful where you put it because I just tried to remodel my house and it just won’t move 😦 Deleting the room won’t work. Have you tried clicking near it instead of directly on it to move it? Hi. I know this post is quite old now, but I just purchased the mop from the online store (£7.99, I think – I must have been mad!) Anyway, I was still annoyed to find out that when I tried to place it, it said it would cost 888,888. However, a few days later, I had another look, and when I tried to place it in a house, it had gone down to 88,889. I can afford that, so I placed it in the house, only to find it didn’t take any Simoleons from me anyway! Just thought I’d share this in case anyone else has done/thought the same! 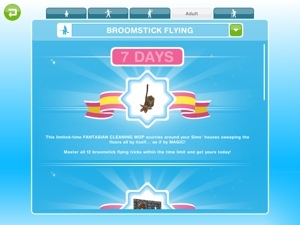 I just finished the broomstick flying hobby and unlocked the pack. Apparently, now the secret door is unlocked with the builder’s pack. I finished the spellcasting hobby and it said i unlocked the broomstick flying hobby. Went and bought the closet out of the hobby store but when i went to place it, i can’t because it says “limited object” …which i know but never placed it anywhere? help? i looked all over to see if i maybe accidentally placed it somewhere but nothin! A lot of players are having this problem with the new items tab, if you go to the hobby and career items tab of your inventory you should be able to place the broomstick closet. You cannot find it in the sorcerous supplies store? Or the promotions r us store in the hobbies section?